OK, this might be one of my favorite shows ever to participate in. "Suspense & Gallows Humor" a tribute to the all-time greatest... yes, Alfred Hitchcock, my all-time favorite director! The show opens this Friday, the 13th (too cool!) 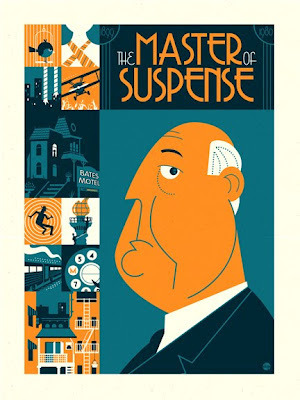 at Gallery 1988: Venice and will feature 75 artists creating art inspired by the Master of Suspense. For my piece I had trouble really picking one of his films to focus on so this is what I came up with this. Oh, and if you're wondering what the train is from... could be "Strangers on a Train" or "Lady Vanishes" or "39 Steps"... its a mystery! Wonderful work! love the Hich! Bought this one, so great!